The revisions feature will create a revision (snapshot) for every document, upon every update received or when it is deleted. It is useful when you need to track the history of the documents or when you need a full audit trail. By default, the revisions feature will track history for all the documents and never purge old revisions. You can configure this for all collections (using the default configuration) and you can have a configuration for a specific collection. Purge on delete Configure whether to delete the revisions upon document delete or create a delete marker instead. Limit # of revisions Configure how much revisions to keep. Default: unlimited. Limit # of revisions by age Configure a minimum retention time before the revisions can be expired. Default: None. Disabled If true, disable the revisions feature for this configuration (default or specific collection). Default: false. It is possible to have a default configuration telling the revisions feature to revision all documents. Set Disabled=false, which is the default, on the default configuration, and only keep up to 5 revisions, purging older ones (MinimumRevisionsToKeep=5). Then override the behavior of the revisions feature by specifying a configuration specifically to a collection. Conversely, we can disable the default configuration (Disabled = true) but enable revisions for a specific collection. As you can see, we have a full audit record of all the changes that were made to the document. You can access the revisions of a specific document by the document's ID ("users/1"). Or you can access a specific revision by its change vector or by a specific date. Accessing a revision by a change vector would return a specific revision, while accessing a revision by a date would return the revision on this specific date if exists, and if not it would return the revision right before this date. Now, let's delete the document. The document would be removed but a revision will be created, so you aren't going to lose the audit trail if the document is deleted. 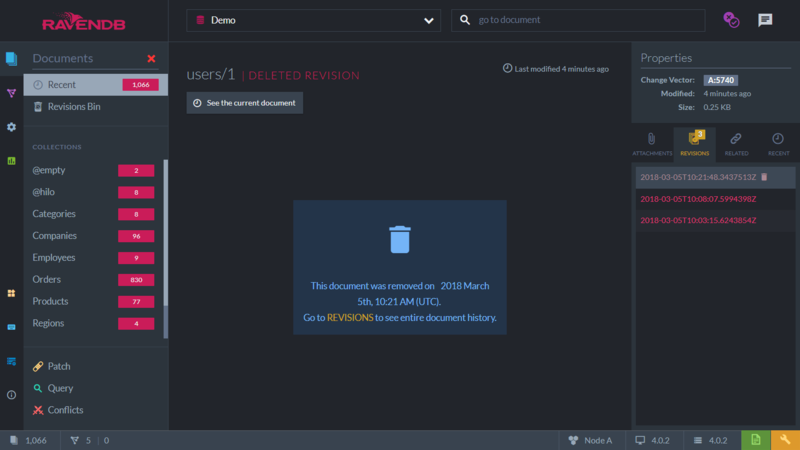 If you'll go and create another document with this ID (users/1), then the revision won't be shown anymore in the Revision Bin section, but you can navigate to the document and see it's revisions, including the deleted once. The revisions feature attempts to make things as simple as possible. 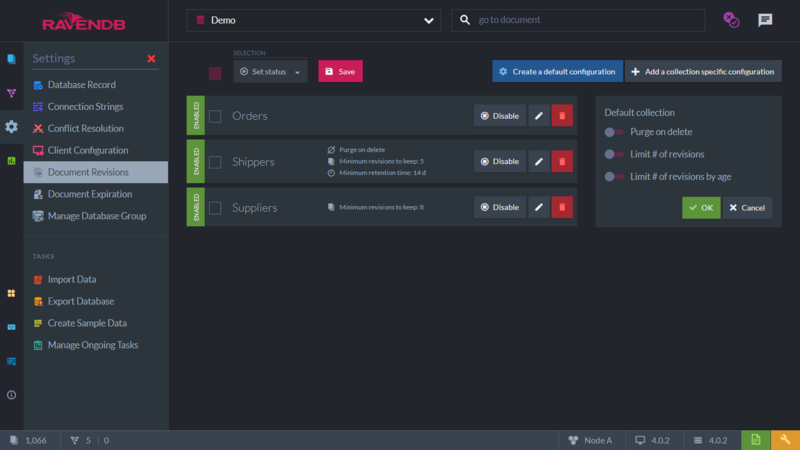 Once it is enabled, you'll automatically get the appropriate audit trail. 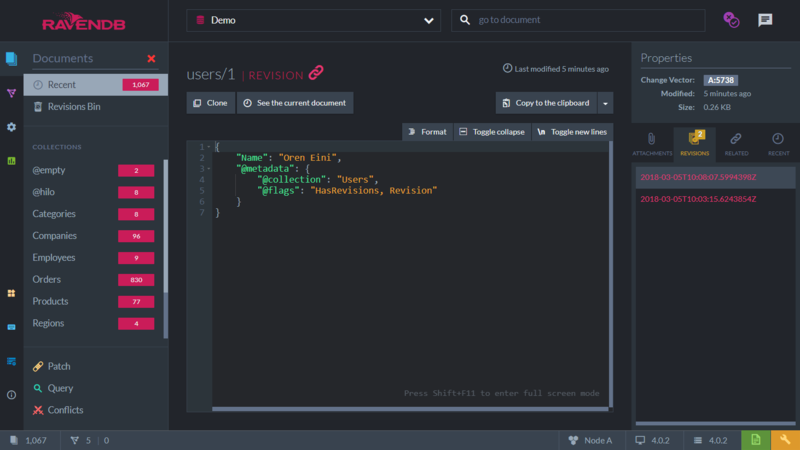 The revisions feature can be enabled on a existing database with (or without) data with some restrictions. You need to bear in mind that new revision will be created for any new save or delete operation, but this will not affect any existing data that was created prior turning that feature on. If you create a document, then turn on revisions, and then overwrite the document, there won't be a revision for the original document. However, you would have a revision of the put operation after the revisions feature was enabled. 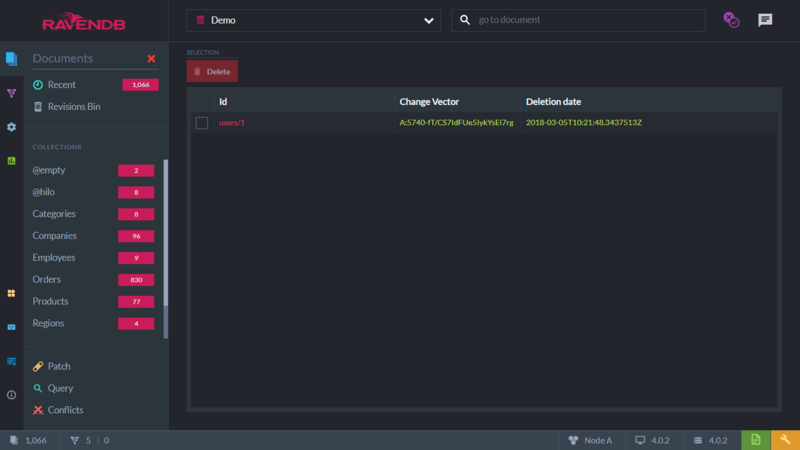 It's possible also to disable the revisions feature on an existing database. In this case all existing revisions would still be stored and not deleted but we won't create any new revisions on any put or delete operations. Enabling the revisions will affect the usage of storage space. Each revision of a document is stored in full. The revisions of documents use the same blittable JSON format as regular documents so the compression of individual fields is enabled (any text field that is greater than 128 bytes will be compressed).